Varicose Vein is a vein disorder where the veins gnarled and enlarged. The varicose veins generally appear in the lower limbs of the human body. The varicose vein treatment market consists of various treatment procedures such as radiofrequency ablation, laser therapy and so on. The global varicose vein treatment market is growing at CAGR 5.09% and the global market revenue is $ 325 million in 2018 and it is forecasted to reach $ 416 million by 2023. Varicose veins are caused when the veins in the lower limbs do not allow the blood flow effectively. This condition in veins cause swelling, aching and pain in legs. Varicose veins can be classified into trunk varicose veins, reticular varicose veins and telangiectasia varicose veins. The treatment for varicose veins can be given in various methods like radiofrequency ability, laser therapy and sclerotherapy. . 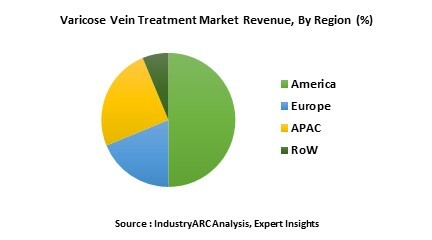 The end users for varicose vein treatment market are segmented as surgery centers and hospitals. One of the major drivers in this industry is the prevalence of varicose veins is high in women. It is more common in older women. The risk of having varicose veins is more in pregnant women and in women who take menopausal hormone therapy. It is reported that women have twice the risk of having varicose veins when compared to men. The major challenge in this industry is neovascularization, a process where regrowth of veins takes place. There are chances that even after a surgery, the varicose veins might regrow. Sometimes varicose veins might develop in other parts of the legs. The base year of the study is 2017, with forecast done up to 2023. The study presents a thorough analysis of the competitive landscape, taking into account the market shares of the leading companies. It also provides information on unit shipments. These provide the key market participants with the necessary business intelligence and help them understand the future of the Varicose Vein Treatment market. The assessment includes the forecast, an overview of the competitive structure, the market shares of the competitors, as well as the market trends, market demands, market drivers, market challenges, and product analysis. The market drivers and restraints have been assessed to fathom their impact over the forecast period. This report further identifies the key opportunities for growth while also detailing the key challenges and possible threats. Varicose Vein Treatment market – By treatment Types: surgical treatments: Vein ligation and stripping, phlebectomy; non-surgical treatments: Laser Therapy, trans-illuminated powered phebectomy (trivex), Radiofrequency ablation; Sclerotherapy. Varicose Vein Treatment market – By Device: Ablation devices: Radiofrequency Ablation Devices, Laser Ablation Devices; Venous Closure Products, Surgical Products. Some of the Key players in this market are Angiodynamics Inc, Biolitec AG, BTG Plc, Energist Medical Solutions, Eufoton S.R.L, Lumenis Ltd, Medtronic Inc., Quanta System S.p.A, Syneron Medical Ltd, and Vascular Solutions Inc. among others. Syneron Candela has been acquired by Apax partners. The Israel based non-surgical aesthetic device manufacturer has become a private company after its acquisition by an affiliate by funds for $11.00 per share was advised by Apax partners. It is reported that the transaction for acquiring Syneron candela was valued at approximately $400 million. This acquisition expands Apax Partners’ investments in Healthcare industry. Biolitec GmbH has launched a laser therapy product named LEONARDO mini and it is reported that this product can carry out laser treatment for varicose veins. The product weighs only 900 grams and it is available in two wavelengths (980nm and 1470nm). BTG plc has acquired Novate medical ltd, a medical device manufacturer. BTG plc has paid $20 million in cash and it might be required to pay additional cash considerations up to $130 million if few commercial and sales related milestones are met. Health Canada has approved Varithena, a drug and device combination product used to treat varicose veins. The product from BTG plc is intended to treat venous reflux. Varithena consists of polidocanol injectable foam.